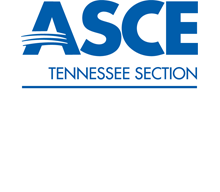 Welcome to the home of the Tennessee Section of the American Society of Civil Engineers! The Tennessee Section is comprised of Branches in Chattanooga, Holston (Bristol, Kingsport, and Johnson City), Knoxville, Nashville, and West Tennessee (Memphis, Jackson, Dyersburg). The Tennessee Section is currently in Region 4. From Graceland to the Grand Ole’ Opry, Lookout Mountain to Rocky Top, and even the Bristol Motor Speedway, Tennessee Section members are engaged in all facets of civil engineering. The Section is managed by a Board of Directors, comprised of members from all Branches and elected annually at the Branch level. There are many opportunities available for those wishing (and willing) to volunteer their services to the Section. We hope that you find the information on our site helpful. If you have questions, please feel free to contact any one of the Board members.